Yesterday in Albuquerque, we had an afternoon thunderstorm. Afterward on our way to dinner, we found this street-wide storm drain with lots of debris. This is one reason why we should not litter. 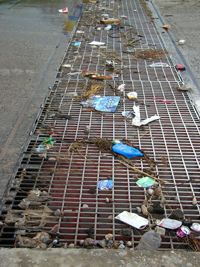 Much of the trash enters the storm drain and makes it way (in this case) to the Rio Grande River which empties into the ocean eventually. Besides polluting our rivers and lakes, we add to the Great Pacific Garbage Patch. Mostly Albuquerque is a very clean city, but the washing of its litter into one location illustrates how much a problem small amounts of litter can become. Today, we walked the LaLuz Trail in the Sandia Mountains in New Mexico. The trail was very clean of litter. 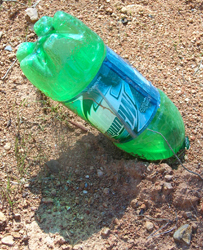 We saw one plastic bottle that was probably dropped by accident. Everyone removes their trash and leaves only footprints. It was a glorious experience. During my short walk this morning, I picked up 9 plastic bottles in the Boone Trace and Lexington Point subdivisions. 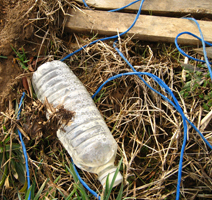 Most of the plastic bottles were on the Lexington Point playground. The trash can at the playground was virtually empty. 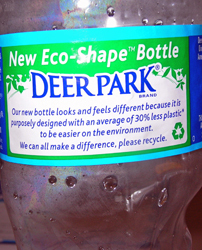 If you can’t recycle (and there is no reason why we can’t), please put the plastic bottles in a trash can. Plastic bottles left on the streets eventually wash into the storm drains which wash into the rivers which wash into the oceans that push the plastic into the Great Pacific Garbage Patch vortex. (Sorry for repeating this warning on my blog.) No one seems to get the message. 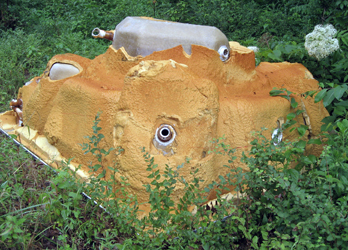 Thanks to the Sierra Club for providing the link to this video about Garbage Island. I just watched all twelve episodes plus the bonus feature on plastic and bisphenol A (we’re all gonna die from plastic). This video explains the Great Pacific Garbage Patch and should be watched by everyone. I eat fish, but I’m not sure if I can after viewing this video. The Great Pacific Garbage Patch isn’t an island that we can walk on, but it’s little pieces of plastic concentrated in ocean water. Fish eat it; we eat fish.